One of the fastest growing sectors in health care comprises the firms that promise that wellness programs will make your employees healthier, will save you (as an employer) money, and will help bend the curve for health care costs in general. The folks who have undertaken this line of work--and the employers that are complicit with them--are skewered in a new book by Al Lewis and Vik Khanna called Surviving Workplace Wellness, currently available on Kindle. The biggest delusion in Obamacare is the idea that clinically based workplace wellness programs will save either money or lives. They are, in fact, a big government, big company-propelled fantasy that the way to spend less money is to spend more. 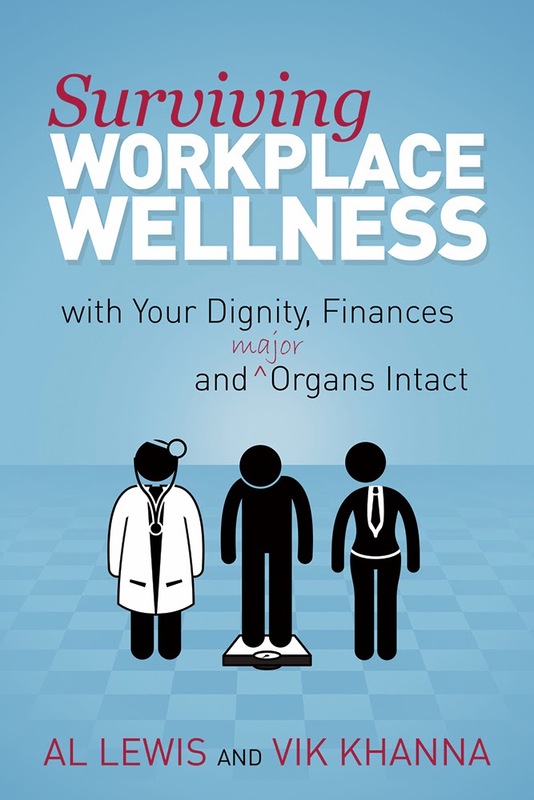 Al Lewis and I have penned the antidote to workplace wellness programs for employees who should resent having the privacy invaded, their medical care disrupted, and their money taken for the sake of the government and employers exerting even more control over their lives. Surviving Workplace Wellness stars the State of Nebraska, Penn State University, Health Fitness Corporation, Truven Health Analytics, WellSteps and a roster of other workplace wellness vendors who missed the casting call for Dumb and Dumber. Yes, Virginia, many wellness programs are part of the medical-industrial arms race. Thanks to Al and Vik for making the truth evident to those who are willing to keep an open mind. There is a paper published in the most recent (January 2014) issue of Health Affairs on this subject that discusses the experience at PepsiCo. The bottom line is that disease management programs lower healthcare costs after taking into account the money spent on the effort but wellness programs generally don’t. generated by false positives through extended screening." The ROI on the disease management program was substantial, so it's possible the unmeasured intervention costs would not have swamped all the medical savings, but we don't know. Thanks for the close read. My bad -- I meant Mercer's fees. The DM was separate from the wellness. Absent DM and absent self-reported absenteeism reduction, there was no gross savings to speak of. If we're counting uncounted things, we might as well also throw in the time required by employees to participate in the wellness program. Er, progress on concussions at the NFL? Is it a sign or is it art? Where is the UI Board of Trustees? Hang 'em out to dry! Wait, "them" is us! A benefit of political gridlock? It won't last. These bonds are a sure thing! The data are wrong. Our patients are sicker. Who is being punished, and by whom?